In short, this is a visualization and natural language processing project for understanding the "nature of podcasts" and seeing their human listeners through topic analysis. Podcasts are typically periodic audio-only Internet 'radio shows' that, like any media, act as a lens into the cultures producing and consuming them. Once niche, around 25% of Internet users listen to podcasts according to the Pew Research Center. Indeed, being online they reach an international community and some also play on typical radio stations. What is the nature of these podcasts? Can they say anything about their audiences? Can they let us see into emerging cultural trends? This project tries to take a first stab at answering those questions. Who are you? Why did you do this? This is a quick (week long) personal project designed and developed by Sam Pottinger done out of personal curiosity while between jobs (not employed at any organization). Sam Pottinger does not have any formal connection to the podcasts included (see below). How did you determine the topics for each episode? Radiolab, This American Life, and The Memory Palace tag their own episodes. Very simple natural language processing via NLTK's tokenizer and SnowballStemmer generate tags for 99% Invisible and Hello Internet based off their text episode descriptions. There was some manual merging and re-naming of tags to keep coherency across shows. Do you have a relationship to any of the podcasts? Nope. Just a fan who tried to choose a broad-ish set of podcasts to visualize. Please see This American Life, Radiolab, 99% Invisible, The Memory Palace, and Hello Internet for information about the podcasts themselves. How did you come up with the visual representation? All work is a little derivative right? This project didn't set out with any other work in mind but I always make an attempt to reflect on the influences behind my work after I get to a release. So... the sense of "tactile" data enjoys a long history but arguably builds from ideas presented by Bret Victor and Daniel Shiffman. The idea of "exposing the individual in the aggregate" comes from a number of sources including Kim Rees, Jonathan Harris, and Moritz Stefaner. Alternative network visualizations like the arc diagram go back a long ways but Tamara Munzner, Philipp Steinweber, and Andreas Koller have done much in exploring that space. Is this a podcast listener? Nope. Hold on to your Instacast licensees and your iTunes accounts. Please do not use this project to subscribe to podcasts. This is not meant to be a distribution channel. Yep but no more invasive than Apache Logs. We collect very basic usage statistics (which parts of the visualization are being clicking on) and, on top of that, we have a run of the mill terms of service. This is effectively an hit-level log which includes an IP address, a non-identifying randomly generated user ID, the button clicked on within the visualization, and the time. The desktop application does not report usage statistics if you would prefer not to have those logs collected during your session. Colebourne, Stephen. "Joad-Time." Joda.org. Joda Project, n.d. Web. 15 Apr. 2015. Denicola, Domenic. "Domenic/dict." Github. N.p., n.d. Web. 15 Apr. 2015. DiMeo, Nate. "Episodes." The Memory Palace. Nate DiMeo, n.d. Web. 15 Apr. 2015. Glass, Ira. "Radio Archive by Date." This American Life. Chicago Public Media, n.d. Web. 15 Apr. 2015. Grey, CGP, and Brady Haran. "Hello Internet." Hello Internet RSS Feed. N.p., n.d. Web. 15 Apr. 2015. Harris, Jonathan. "We Feel Fine." Number 27. N.p., 2006. Web. 15 Apr. 2015. "JQuery." JQuery. JQuery Foundation, n.d. Web. 15 Apr. 2015. Kamvar, Sep, Sep Kamvar, and Jonathan Jennings Harris. We Feel Fine: An Almanac of Human Emotion. New York: Scribner, 2009. Print. Mars, Roman. "Episode." 99% Invisible. PRX, n.d. Web. 15 Apr. 2015. Munzner, Tamara. "15 Views of a Node Link Graph." YouTube. Google Inc, 22 Aug. 2012. Web. 15 Apr. 2015. "NLTK 3.0 Documentation." Natural Language Toolkit. NLTK Project, n.d. Web. 15 Apr. 2015. "P5.js." P5.js. Processing Foundation, n.d. Web. 15 Apr. 2015. "Podcasts." Radiolab. WYNC, n.d. Web. 15 Apr. 2015. "Processing.org." Procesing.org. Processing Foundation, n.d. Web. 15 Apr. 2015. 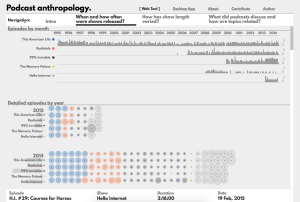 "Radiolab Archive." Radiolab. WNYC, n.d. Web. 15 Apr. 2015. Rees, Kim. "Living, Breathing Data." YouTube. Bocoup LLC, 5 June 2013. Web. 15 Apr. 2015. Rich, Micah, Caroline Hadilaksono, and Tyler Finck. "League Spartan." The League of Moveable Type. A Good Company, n.d. Web. 15 Apr. 2015. Richardson, Leonard. "Beautiful Soup." Beautiful Soup. N.p., n.d. Web. 15 Apr. 2015. Sanchez, Gaston. "Star Wars Arc Diagram." N.p., 3 Feb. 2013. Web. 15 Apr. 2015. Schwartz, Barry. "Fanwood." The League of Moveable Type. A Good Company, n.d. Web. 15 Apr. 2015. Shiffman, Daniel, Shannon Fry, and Zannah Marsh. The Nature of Code. New York: Interactive Telecommunications Program at New York U, 2012. Print. Stefaner, Moritz. "Elastic Lists." Http://archive.stefaner.eu. N.p., n.d. Web. 15 Apr. 2015. Vepsäläinen, Juho. "Bebraw/setjs." GitHub. N.p., n.d. Web. 15 Apr. 2015. Victor, Bret. "Media for Thinking the Unthinkable." Vimeo. MIT Media Lab, 4 Apr. 2013. Web. 15 Apr. 2015. Wood, Tim, and Iskren Cherne. "Moment.js." Moment.js. N.p., n.d. Web. 15 Apr. 2015. Zickuhr, Kathryn. "Over a Quarter of Internet Users Download or Listen to Podcasts." Fact Tank. Pew Research Center, 27 Dec. 2013. Web. 15 Apr. 2015.